Hi, this is Sean Michael. I’m a prisoner in California, and am here today, at Björn’s request, to let you all know who I am and what poetry means to me. I am a man who had a difficult childhood with drug-addicted parents and a cruel foster parent. I entered the state system in my early teens and have lived within the system as much as I have out of it. My own drug addiction led to my imprisonment for felony murder—a man was thrown from the back of a truck I was stealing and killed. I didn’t even know he was back there; I heard yelling but thought it was the same voices I frequently heard in my head. I wrote my first poem at the age of eleven. Poetry came to me as a saving grace during a turbulent time in my life while I was in foster care. Poetry and I haven’t always gotten along though. Once, in a depression, I read through the poems in my composition book and decided they were stupid. I lit them on fire in the alley behind my place of employment. I decided I wouldn’t ever write again, only to discover later that it wasn’t entirely up to me. Writing was a gift that was given to me by the universe to be cherished, nurtured, and cultivated. Ultimately, my poetry was meant to be shared with others for them to relate to, to be inspired by, to be amused by the ramblings of a madman at times, to decide if they like it or not and what they can take from it. The reward for me is knowing it’s there for these reasons and having gotten what I had to say off my chest. Since I’ve come to prison, poetry has become my way of communicating with the world, of letting them know, “Hey, I’m not done yet.” Poetry and writing in general has given me some sense of mental, spiritual, and emotional freedom. Freedom to create and freedom to express, and, hopefully, writing will help me stay focused and sane, and perhaps, lead to my eventual physical freedom. lonely days keep passing me by. I hold back the tears, cuz I can’t cry. What’s the point in living when I am dying inside? true peace I’ll never find. waiting for the angel of death to arrive. How can I explain my pain? A lot of people talk about what they don’t really know. as my serrated blade tears through their soul. Time has made me colder than a corpse. I think I need a divorce! When I was first incarcerated, my anger overwhelmed me, and I felt a constant need to prove myself as a tough guy not to be messed with. I got in fights and had to be subdued more than once. As a result, I have no access to computers or the Internet. My maternal grandmother very kindly types up my writings and posts them to my blog at WordPress, Twitter, Facebook, and d’Verse. I am grateful to be able to share on d’Verse even though it takes time for me to respond to poems and comments—sometimes as much as a month. (All of my correspondence with Grandma is by snail mail.) I’m always happy and often surprised by the responses I receive to my poetry. It has long been my dream to have a book published and this month that dream came true. 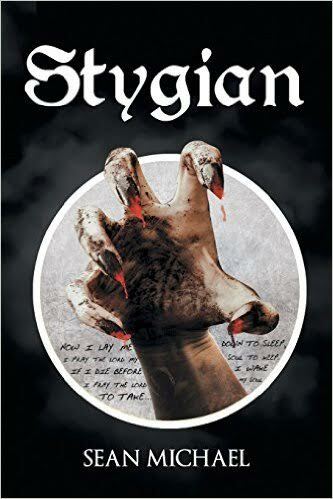 My first book of poetry, “Stygian,” is now available on Amazon in both paperback and Kindle formats. Most of the poems are about my childhood and prison. I’ve also written an autobiography and am working on a book about prison. I paid for Stygian to be published by Page Publishing, but don’t have the money to do that again, so need to find an agent—not an easy thing to do. Here is one last poem called “Endless Tunnels of Darkness.” I wrote this one in 2014. I wanted to bring in Sean because there are so many life experiences in this community, but Sean’s has to be the most extreme. As you might understand he has no access to Internet, so all updates and responses are done by his grandmother who prints out poems and do responses. Therefore it can take some time for Sean to come back. What do you think, is it a good idea to learn a bit more about some of the poets as part of the Open Link? Does it inspire you? Does it make you curious for more? Anyway now it’s your part: Today you can link up any one poem below. This can be an old favorite, something you have rewritten or entirely new. Then the fun begins, browsing around for all that poetry. If you are uninspired, maybe you can start to read, and get inspired. Or if you have missed any of our previous prompts you can use that. Remember to comment on poems, and take part in the discussion below. Welcome everyone … Open Link is open. I enjoyed Sean Michaels works. Thank you for Sharing. He shared a valuable lesson for those who would hear it. I think it’s an excellent idea to learn more about the people that make up this wonderful community. Sean is so utterly inspiring, because he has worked out a way to communicate, despite all the odds. I feel humbled, completely humbled. Thank you for sharing Sean’s story with us – I had ‘met’ him a long time ago, but lost touch with him due to my own absence from here for some time. It’s good to be reacquainted with him. I sincerely wish him all the best and am so glad he has found a way to be himself through his poetry, and that dVerse has become on of his outlets. I agree… and it makes his poetry all the more real to me… so different for many of us yet so close and possible to comprehend through poetry. It does the same for me, too. I love the wat we all, who are surely so different, can connect in this way. Hello Bjorn! Thank you for sharing Sean’s story with us. Very inspiring. Glad dVerse has become an outlet for him! I think it is for many of us, and I’m i think his grandmother should be thanked as well…. Thanks for hosting tonight Bjorn 🙂 good to see you. Bjorn – I have two entries of the same thing for some reason! Thanks for hosting. Indeed an inspiring read about the crucial role that writing has made on his life. Thanks also to his grandmother who patiently links up and showcases her son’s work. I will be hitting the poetry trail once I am home. Ha you are probably home after I’m in bed… I love the time differences. Maybe you did; maybe you didn’t. But I feel like you invited Sean to “speak” because I needed to hear from another “crazy person.” Either way, Sean’s message touched me right where I needed to be touched, in just the right way. So thank you, Bjorn, for deciding to do this. Sometimes I feel like the only one around here who fights seemingly unconquerable demons and grapples with “voices” and divisive personalities. I think that all the time … if only I don’t write, then I’ll be okay. An intriguing story, is Sean’s! Poetry can certainly provide solace and release. Highlighting our poets is a wonderful idea. It would be interesting to see how background and similarity works for individual poetic processes. Do more, please! I agree….Poetry and Demons go together. A constant battle. That poetry has, in a very real sense, become the venue of redemption for Sean’ is rather universal to many of us. Thank you for posting Sean’s presence…and also to his grandmother. That is a true expression of love! You have hit upon the truth relating to poetry and demons. I find it hard to write without drama or strife. Me, too…but I think that drama and strife make a work interesting. It’s those conflicts that spark our attention. Hi Bjorn and Freye. I agree that it’s an excellent idea to learn more about the people behind the poetry at the Poets Pub. I think Sean’s poem, ‘Endless Tunnels of Darkness’ conveys his situation so well to those of us who have no experience of prison. I admire his determination to write under such oppressive circumstances, wish him well and look forward to reading more of his work. Thanks for sharing Sean’s story with us, Bjorn. Absolutely, knowing the stories of some of the poets is a great way to give their writings a greater depth. I wish Sean success with his book. It’s a wonderful, positive and lasting thing to do, and hopefully just a start. I appreciated the poems. It’s almost exactly three years since I last posted here, and it took quite a long break to get back into writing. Its Matthew right? Thanks for joining us. And you are always welcome here even after a long absence. Yes, I think it is a good idea to learn more about the people that post here. I did like to learn more about Sean and wish him the best of luck. I am sorry for what has happened to him and hope he will be released from prison soon. I enjoyed reading his poetry and look forward to reading more! Thank you for telling us more, and thank you to his Grandmother. Thank you for coming by Annell.. just read you poem.. so very touching in its context. Angels & demons–thorns & wildflowers–bullets & butterflies–yes, poets are stimulated by the entirety of their environment. Thanks for including Sean’s input. It is fascinating to learn more about each of us. I do miss the interviews that used to appear regularly here. I’m fighting with my computer yet again, needing to jump back & forth from Chrome to Word Press to get my editing done, so too often my poetry gets splashed every which way on the blog(s). Oh well, perfection is overrated. Oh.. yes sometimes we do have those struggles… I have come to terms with most of them… but I liked to be back with Blackthorn. Perfection is definitely over rated. As far as I know, Spock was one of the few who achieved it and he had those weird ears!!! What a great idea for OLN. Sean’s story breaks my heart. His poetry is powerful and raw. I’m glad you decided to have him be a guest blogger today. I decided to link something a little different today. It’s a little piece I wrote last week while I was at a writers’ conference taking a coaching class on memoir writing. One of the days of the class the teacher asked us to write our story as a poem, suggesting a haiku. I raised my hand and suggested that another option for paring down one’s story that is a little more forgiving than haiku is the Quadrille. Several of the people in the class, including me, wrote a Quadrille for that exercise. I almost linked to that post, but I like my “Meanwhile” post better. Now I’m off to read a few poems before I need to get back to work. Sometimes there is so much more behind the words… We do learn about each other here… But sometimes I think we need this type of presentations. The sheer power of words….for the writer, for the reader. Thank you for this conversation, Bjorn. As always, I shall be reading in the early morning with coffee in hand. Hi Lillian! I .agree, powerful words from the heart. See you at the poetry trail. Thanks, Grace. Reading tomorrow – AM – looking forward to it! Wow! Thank you for featuring Sean. His story is inspiring and eye-opening. His poetry is intense. I wish him well in his poetry and life. Thanks for dropping by Imelda! Hi Bjorn and Grace, and greetings to all! I really enjoyed Sean’s presentation here and learning more about him. I didn’t know that it was his grandmother who has been the bridge between him and us. I’ve often visited his blog when he has posted something and knew of his being in prison but this gives further insight into his background and who he is today. Having been able to get to know many of my fellow poets out here in the blogosphere, I know that many suffer from mental challenges as well as physical. It seems that writing is a natural way to deal with our emotions and painful circumstances. I also like the idea of getting to know our members better. I wish Sean the very best and a peaceful heart. Hi Gayle! I thought his story was pretty unusual but I have learned from other bloggers (those with addictions) that writing have saved them too. His story is unusual, heartbreaking and inspiring at the same time. I enjoyed reading about Sean. It hit close to home for me because I have a brother in prison for 2nd Degree Murder. He was driving drunk and killed our niece who was riding on the back of his quad. He’s in for at least 30 years. Do we post our poem here, or do we post a link? I’m new here. First time I have checked you all out. Welcome to D’verse Cindy! Please post your poem directly, when you click Mr. Linky. You will find in Mr. Linky all the other poems as well. I’m sorry to read about your brother. I am very interested to read Sean’s story. At Poets United, we have found getting to know peoples’ stories helps us understand their poetry in more depth, as we get a sense of who the person is and what they are writing about. Always a good thing. I am going to leave a message for Sean (about self-publishing, it’s cheap!) on his blog in hopes he gets it, given his lack of access to internet. Thanks, Bjorn, for giving him this platform. You are kind. People lead such incredibly challenging lives. I am glad Sean has his writing. I wish Sean success with his books and may he be blessed with many writing buddies!! Thanks for giving Sean this publicity and exposure. Getting so close to someone else’s terrible reality is humbling. Instead of condemning Sean and turning away, we are all supporting him and his efforts. And what an effort it is! My first thought was, in facing another dreadful reality, what will happen if Sean’s grandmother becomes ill or passes away? From what I’ve seen on his blog, he doesn’t have much hope of being released any time soon? I just scanned so far and will do more in depth reading now-now. I’d like to offer to stand in – in case of crisis on his side. I’m on the other end of the world though and if snail mail is the way he has to operate, it may take longer and postage be more expensive? A thought. Finally came up with something! Changed my mind a few times what to post. Pps – just opened them! Bjorn, what a wonderful idea to give voice and story of someone who might otherwise fall through the cracks. Sean’s poetry is powerful, and I hope to see more of it. If a person is willing to share what is in their head and heart, let’s give them a chance to be heard.